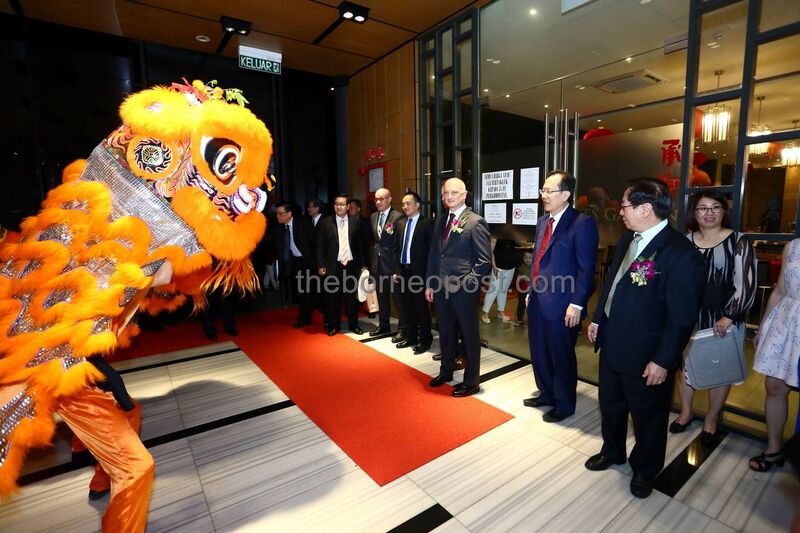 Nikolas (third right) with Henry (second right), Vincent (right) and others watch the welcoming lion dance. Nikolas (fourth right) presents a plaque to Henry. Seen are Vincent (third left), Ling (second left), Stephen (left) and Selena (third right). KUCHING: KTS Group of Companies (KTS) is committed to promoting, sustaining and protecting Stihl business in East Malaysia and Brunei. Its managing director Dato Henry Lau said Stihl business “has become our way of business life and our pride”. 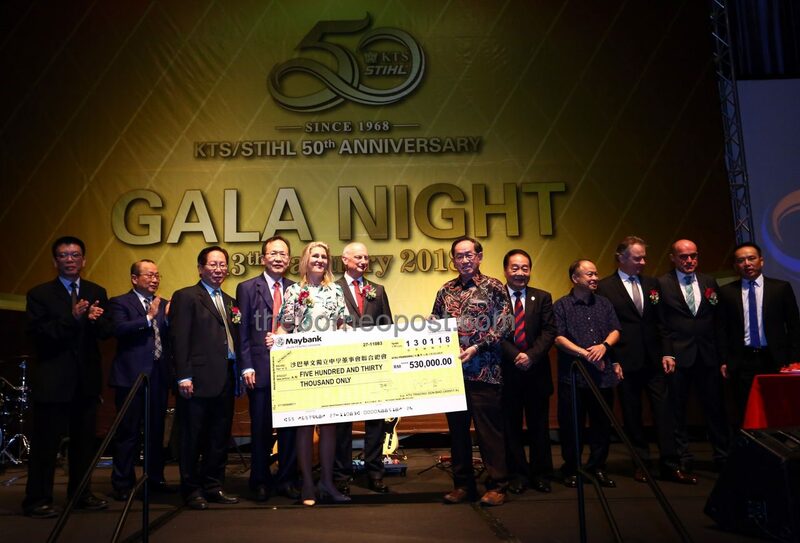 “And we can rely on Stihl to be equally committed come sunshine or rainy days,” he said at the KTS-Stihl 50th anniversary gala dinner at KTS Garden on Saturday. 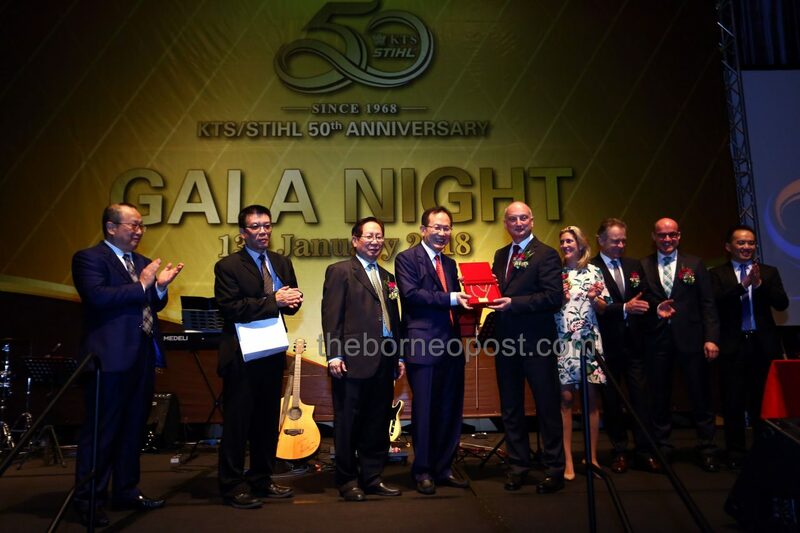 Lau said KTS began introducing Stihl products in Sarawak, Sabah and Brunei way back in 1968. He added that the relationship between Stihl and KTS started with a handshake and a one-page agreement, after which they never looked back. He took pride in announcing that this “golden relationship” precipitated from mutual trust and confidence in weathering challenges, financial crisis and rampant competition. “Of the 50 years of relationship, I was tasked to be involved for about 15 years at the front line of the Stihl business and another 10 years of supervisory role. “I experienced immense benefit from the philosophy of Stihl’s business conduct to the credit of one particular Mr Hans Peter Stihl (German industrialist who was head of Stihl from 1973 to 2002) whom I came to trust and respect without reservation. “In fact, many times Mr Peter Stihl responded generously to my request for his advice on business management, family participation toward the success of Stihl business and reading of Germany and world economies. His air of confidence, gentlemanliness and sensibility are his benchmark. “The ability of Stihl in maintaining its excellence continuously in its products in spite of rapid change of time in today’s environment exemplified perfectly in the succession of Mr Peter Stihl’s role,” pointed out Lau. Representing Stihl were Advisory Board of Stihl Holdings chairman Dr Nikolas Stihl and member Selena Stihl. Nikolas, in his speech, attributed Stihl’s outstanding brand reputation in East Malaysia and Brunei to the hard work and commitment of KTS Group of Companies (KTS). Nikolas said the business of KTS-Stihl in the region had grown steadily over the last five decades. “Today, KTS has a strong sales organisation with distribution through its own branches and authorised Stihl servicing dealers. Apart from chain saws, KTS began at an early stage to offer other hand-held outdoor power tools such as brush cutters, sprayers and palm cutters. 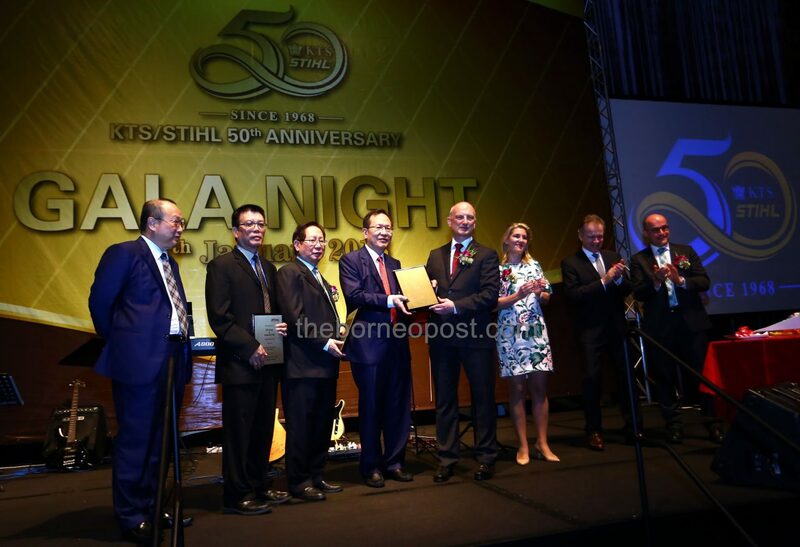 “Today, the Stihl brand enjoys an outstanding reputation and we hold leading positions in Sarawak, Sabah and Brunei. This is, to a large extent, the result of KTS’ successful work and great commitment. “What started with an order of 200 chainsaws has grown to a business with more than 30,000 power tools sold last year,” he said. Nikolas reiterated that “KTS is outstanding” compared to other Stihl distributors. He extended his appreciation to Henry and deputy manager director Temenggong Datuk Vincent Lau as well as their capable team and qualified dealers for expanding the business steadily. According to Nikolas, KTS is much more than just a distributor of Stihl products. He said Henry had pursued his father’s (KTS founding managing director the late Dato Sri Lau Hui Kang) path in a very successful manner. “Still family-owned, KTS has in the meantime grown to be a group of companies with timber business, agriculture, oil palm plantations and general trading as well as land development, to name only the mainstays,” noted Nikolas. He said Stihl is pleased that KTS has been a very loyal partner over the last 50 years. “We have greatly appreciated the close collaboration and returned that loyalty as a matter of course even in difficult times. For example, we jointly overcame the deep recession caused by the Asian financial crisis at the end of the 1990s. “During that period, KTS succeeded in retaining qualified staff, which proved to be the basis for growth after the crisis. Having lasting success since 1962, you always carried entrepreneurial responsibility, proving your social accountability at the same time. 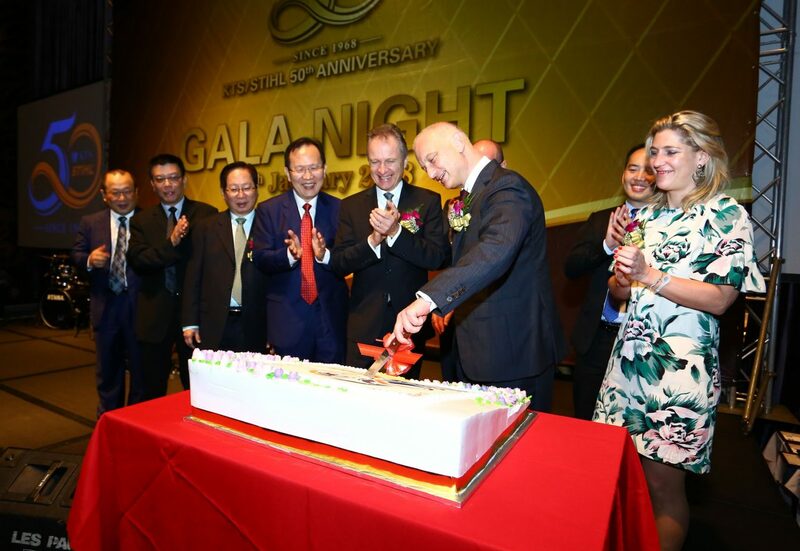 This makes Dato Henry Lau and Datuk Vincent Lau special and good corporate citizens,” he pointed out. Nikolas said he was also delighted to see the next generation of Lau family in the company. While lauding KTS for its farsightedness, he pledged that Stihl would remain at the leading edge of technological progress for further success. “Stihl will adhere to its long-term strategy and sustainability based on innovation, premium quality and extensive customer orientation as well as permanent investments in modern production facilities and highly committed to environmental protection. “Stihl is a strong and independent company on a very sound financial footing – 100 per cent family-owned and thus long-term oriented. “What started with a distributor-agreement in 1968 has grown into a solid partnership of two successful family-owned companies – on the back of mutual understanding, trust and loyalty. You (Henry), your father and your brother have accomplished an amazing feat,” added Nikolas. 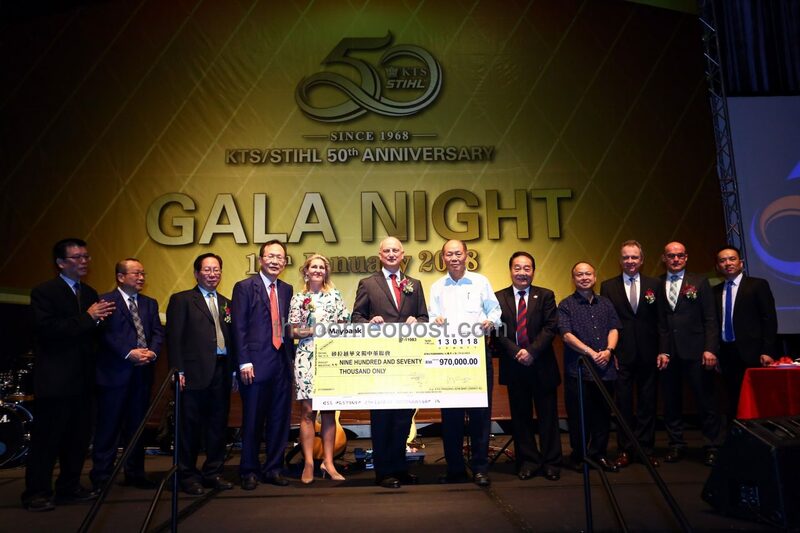 At the dinner, Nikolas handed over RM970,000 to the Sarawak United Association of Chinese School Boards of Management secretary-general Kong Chong Men while Selena presented RM530,000 to the United Association of Private Chinese Secondary Schools Committees Sabah chairman Datuk Yong Kyok Ming. Witnessing these presentations were Minister of International Trade and E-Commerce and Second Finance Minister Dato Sri Wong Soon Koh as well as Kuching South City Council (MBKS) mayor Datuk James Chan. KTS also took the opportunity to extend appreciation to 31 Stihl dealers who had been with the company for at least 22 years. The most notable recipient, Syarikat Guan Chiong (S) S/B, has been in partnership with KTS for 50 years. Representing the dealer company to receive the long-service award was Kieu Bik Siong. KTS deputy managing director Stephen Lau and KTS light machinery department general manager Augustine Ling were among those present. Henry (fourth left) presents a memento to Nikolas. Seen are Vincent (third left), Stephen (left), Ling (second left) and Selena (fourth right). Nikolas (sixth left) hands over the mock cheque to Kong. Seen from left are Ling, Stephen, Vincent, Henry, Selena, Wong and Chan. Selena (fifth left) presents the mock cheque to Yong. Seen from left are Ling, Stephen, Vincent, Henry, Nikolas, Wong and Chan.